Culinary competitor Amy Ridley is as excited as anyone in Kellerton, Michigan to have DIY Home Improvement star, Phoebe Plymouth, come to town for the first annual Cabin Fever Cure event. However the TV personality’s sour attitude quickly curdles people’s opinion of her. When she’s found dead, at the business owned by Amy’s husband, Alex, the heat is on to catch the killer before his professional reputation is ruined! When Amy seeks help in preparing for a vegan baking recipe contest, she also finds assistance from an unlikely team of sleuths who want to help her catch the murderer. But things go from bad to worse when Alex and his business suddenly suffer a series of less-than-random attacks. Are the murder and attacks related? Amy vows to figure it out before her and her husband’s lives are ruined…or ended permanently! 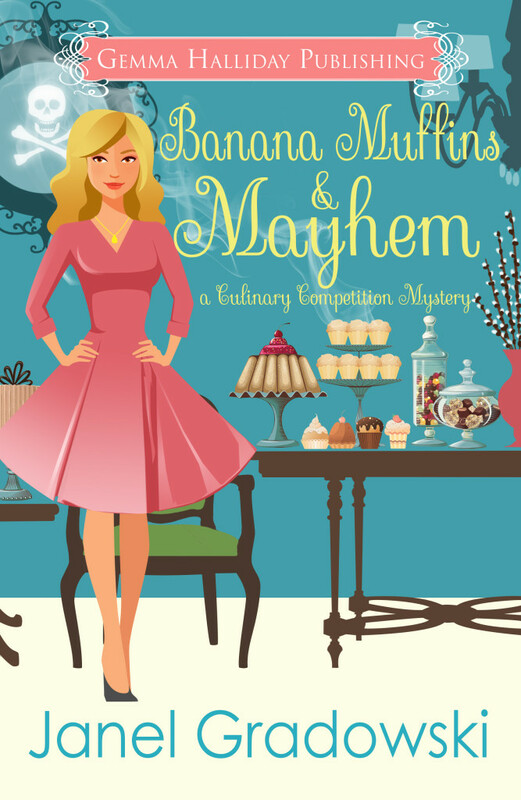 Banana Muffins and Mahem is the fifth book in Janel Gradowski’s Culinary Competition mystery series. I adore cozies because they allow me to escape to charming neighborhoods I would love to visit in person. Kellerton, Michigan, is the fictional town and it is perfectly quaint. I can easily see myself passing time at The Riverbend Cafe sipping an aromatic coffee and enjoying a sweet pastry. I would take artist dates to Make It a Unique, a do-it-yourself pottery painting shop, and The Inkwell, an artistic oasis offering pen-and-ink drawing as well as calligraphy courses. And I would linger for hours at The Cookbook Nook, searching for culinary inspiration. Every good cozy also includes a cast of interesting characters, and this one is no exception. Amy Ridley, our protagonist, is a prolific cook as well as amateur sleuth. She also has a fondness for using culinary analogies, which adds a wonderful sense of warmth and humor to the storyline. She is married to her supportive husband Alex, who in this story, is also an apparent target of an unknown murderer. Amy’s best friend, Carla, is a former emergency room nurse who just recently became a stay-at-home mom – and she happens to be married to Shepler, a local police detective. While these two play minor roles in this particular story, I like the possibilities they offer to a cozy mystery series. Carla’s mother, Geri, is a free-spirit artist who reminds me more of a twenty-something hippie than a grandma. But Geri has a heart of gold and an inquisitive mind. She is integral in helping Amy solve the murder and bring peace back to the Kellerton. Tommy and Charlotte round out the list of characters. They are sisters who are completely opposite in every meaning of the word. Tommy is the owner of Make it Unique and Charlotte is an interior designer and owner of Unique Decor. Often these ladies get together for impromptu Whine and Wine events. Oh… the fun I could have at one of these meetings! An entertaining cozy not only provides a charming setting and a fun cast of characters, but it also keeps the reader guessing. Banana Muffins and Mahem delivers on all three accounts. Phoebe Plymouth is the unfortunate victim, but Ms. Gradowski does such a fine job of describing her unpleasant personality, that I completely understand why everyone in town would wish her dead. The extensive list of prime suspects is not whittled down until the end of the story, which is exactly what I enjoy most about this genre. While I always try to figure the whodunit before the end, I never succeed. Which only fuels my desire to try again. Fortunately, this series will provide plenty more opportunities for me to hone my sleuthing skills. As an added bonus, there are a number of recipes included with this series. I am most anxious to try to the “award winning” Malted Chocolate Banana Muffins. Caveat: I received this copy from the publisher for review purposes. Janel, I first met you online when you were writing flash fiction. What made you decide to write a culinary cozy? Have you always had an interest in cozies? Was this series your first attempt at writing a cozy? I have loved the culinary cozy genre from the moment I began reading it, about 10 years ago. When you first met me I was only writing very short stories (flash fiction). I honestly never thought I would write anything longer because I was intimidated by the work that went into a full-length novel. Then I wrote a short mystery story for a contest that author Gemma Halliday was holding. That turned into a contract offer from her new, at that time, publishing company to turn that 2,000 word story into a novel. I’ve never been one to shy away from challenges, so I went for it and became a culinary mystery novelist. Writing a cozy was on my bucket list when I was writing only flash fiction. So I’m happy to say I’ve crossed that milestone off my list six times now! How long have you had an interest in writing? When did you decide to pursue it professionally? How about cooking – have you always had an interest in cooking and/or baking? I have wanted to be a writer since I was a child. When I was in my teens and early twenties I wrote some short stories and submitted them to various magazines, but I was never published. I set writing aside after I got married and had children. When I turned forty, I decided it was time to begin writing again. I guess it was a form of a mid-life crisis because I didn’t want to spend the rest of my life wondering what I could’ve accomplished as a writer if only I had tried. I began writing flash fiction because it allowed me to play in many different genres and styles. I’m grateful that quite a few of those little stories were published. That experience gave me the confidence to move on to full-length cozies. I wasn’t really interested in cooking when I was a child and teen, even though my mother was a great cook. However when I got married in my early twenties, we couldn’t afford to eat out for every meal. I had to cook, and I discovered that I couldn’t make Hamburger Helper correctly if my life depended on it! Luckily The Food Network was a brand new cable TV network. I loved watching the shows and learned how to cook many things thanks to the celebrity chefs. Did you envision a series when you began this writing project – or did you start with just a stand alone? How far in advance do you plan the next book in the series? When I wrote the short story that eventually turned into the first couple chapters of the first book in my series, “Pies & Peril”, I had no plans for a series – only that story. I would say my planning process for the series is very organic. I carefully plot each book before I begin writing it, but I don’t really have much of an outline for the entire series. And I like it that way – because when does life ever go as we plan? What is your writing process? Do you consider yourself a plotter or a pantser? (I would think writing a mystery, you need to know the end before you begin?) Do you write every day – at the same time of day? How quickly do you draft a novel? How much time do you allow for revision before sending it to publisher? What do you find the most difficult in the writing process? My books start with little “seed” ideas. I began writing notes on index cards about anything that comes to mind. Once I have a nice collection of ideas I lay everything out on the floor to see what I have. Eventually I end up with a scene-by-scene, color-coded outline which I write from. When I am drafting a novel I try to write every week day. With two teenagers I’m often busy on the weekend, so it isn’t unusual for me to take weekends off from writing. It takes me one to two months to write a rough draft, which I try to get done at least a month before my deadline to allow for plenty of revision time. Often the promotional part of being a writer is the most difficult part for me. Usually I juggle working on a new book while also trying to get ready for a book release by setting up things like advertisements and this book tour. Both jobs are creative, but very different. Do you develop your own recipes? How do you research recipes? How much time do you spend developing recipes vs writing? I do come up with all of the recipes that are included in my books. For research I use Pinterest, where I have private boards to save recipes similar to whatever I have mentioned in my book. Often I end up taking bits and pieces from many recipes and combine them into an original one. I always develop recipes at the very end of my writing process. I actually turn the book into my publisher and then add the recipes when it is returned to me for the first round of editing. Even though I write foodie fiction I’ve found that when I’m deep into the writing process, cooking is one of the last things that I think about. Meals are always quick and easy because I’m so focused on writing that I don’t plan meals out. Once I’m done writing the book, then I can turn my creative energy to tinkering with recipes. Do you have another cozy series in the back of your mind? Any other genres you’d like to write? I’m actually editing the first book in another cozy series right now. I’m really excited about the book, and I can’t wait to share more about it soon. As far as other genres go, I really love women’s fiction too. Before I began writing the Culinary Competition series I started publishing a women’s fiction series. So far there are just a novella and novelette in the series, but I do plan to get back to writing more stories for it. Finally, do you have any words of wisdom for pre-published authors? Thank you so much, Janel, for the opportunity to be a part of this Blog Tour. I look forward to following Amy’s culinary mystery adventures. For those who are interested, you can visit Janel on her website, and you can purchase all books in this series via Amazon, Barnes and Noble, iBooks, Smashwords, and Kobo. Collect all of the letters to spell out the Treasure Hunt word then use it to gain extra entries in the Grand Prize giveaway. You can find all of the blog tour stops and enter the giveaway at www.janelgradowski.com. I'm glad to see Janel having so much success!! Thank you for being a part of the tour, Molly. I loved your interview questions! I'm so glad you enjoyed Banana Muffins & Mayhem. Me too… and it's wonderful to stay connected through blogging after all these years! I love it when these giveaway opportunities have a twist. I am not only enjoying all about Janel Gradowski and her new book, but getting to know about new-to-me blogs and bloggers. Thanks for participating in this fun book tour! Loved this interview, and getting a closer look at how Janel writes and creates recipes. The questions were really good!